The N950USQU2BQLA full firmware is live for Samsung Galaxy Note 8 SM-N950U smartphone. We always share full speed Samsung firmware download link for you. 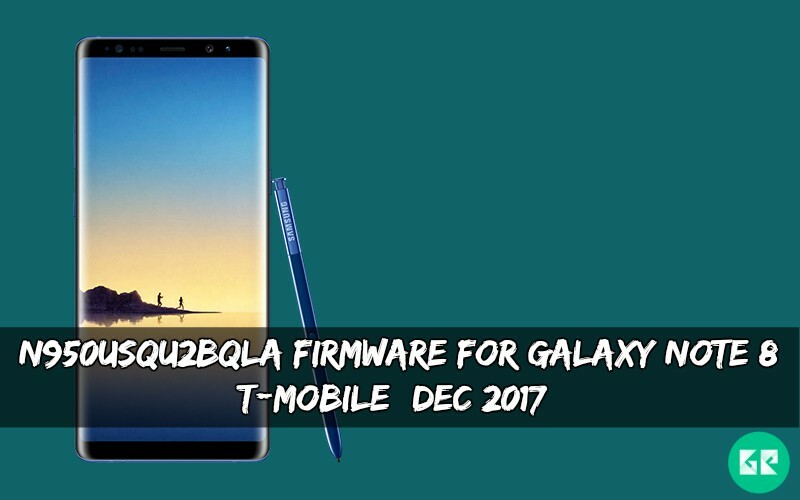 Samsung sends the latest N950USQU2BQLA Firmware For Galaxy Note 8 T-Mobile. that comes with latest December Security patch. If you don’t update your device, to latest security patch then you are the right place. Samsung released Galaxy Note 8 smartphone with Android v7.1.1 (Nougat). Galaxy Note 8 devices run 1.6GHz octa-core Qualcomm Snapdragon 835 processor and it comes with 6GB of RAM. Galaxy Note 8 has 6.3 inches Super AMOLED capacitive touchscreen with a resolution of 1440 x 2560 pixels display. This device has Dual 12-megapixel rare camera for photo and 8-megapixel front camera for the selfie. This update brings some new item and latest December [01.12.2017] security patch update with other some new features. We created the direct download link of N950USQU2BQLA for Galaxy Note 8 T-Mobile Firmware. This firmware only for Galaxy S8 SM-N950U (T-Mobile) version device. You can install via Samsung Odin tool or Samsung Kies we will guide you how to install via Odin. Make sure your device model no is SM-N950U. Download and Odin and Firmware from below. First, extract Odin.zip and N950USQU2BQLA firmware.zip via 7zip. If you want more this type of content then please like our social pages and regularly follow our blog.